Now the important part of Maryland’s gubernatorial election campaign begins. The kickoff took place last week with the first televised debate among the three Democratic contenders. Though far from inspiring, that debate finally focused voter attention on the election. Equally important, it riveted the attention of reporters, who are now intently following comments and policy statements of the three candidates. There’s roughly six weeks until voters must decide in the June 24 primary. And given the massive majority held by Democrats in Maryland, the results of the primary could be the ball game. Attorney General Doug Gansler and Lt. Gov. Anthony Brown tried mightily, but no one drew blood. Gansler delivered some strong blows on Brown’s flubbed role in Maryland’s disgraceful health exchange rollout, but the issue was largely forgotten after the first 10 minutes. Brown tried to hammer Gansler for not stopping a teen beach party, but the attorney general muted that attack by reminding the audience how difficult it is to make the right decisions when it comes to raising kids. Del. 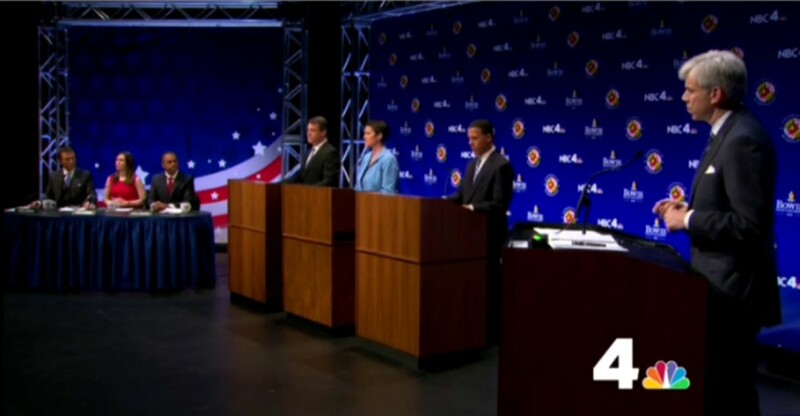 Heather Mizeur decided to step aside while the two other candidates went after one another. No one delivered a compelling message. What we heard was standard campaign rhetoric the candidates have voiced hundreds of times before. New ideas never entered the debate. The candidates rushed through their one-minute responses so rapidly there was no time to expound on specifics. Brown “won” by not losing. As the clear front-runner, the lieutenant governor had the most to lose but he didn’t make a major blunder and stuck to his prepared responses and attacks on Gansler. He didn’t give many Democratic voters a reason to vote for him, but he also didn’t give them much to dislike, either. Mizeur “won” by refusing to attack her opponents. She tried to show she was the issues candidate but in the process revealed an extraordinarily narrow agenda — women’s rights and wage disparity. Gansler “won” by presenting himself as the one candidate willing to criticize the O’Malley-Brown administration. He objected to the administration raising taxes 40 times and Maryland’s worsening anti-business reputation. He suggested voters might want to try a different approach. Kudos to NBC’s David Gregory for running the debate with a firm hand. No one was allowed to abuse the time limits. When attacks were made, Gregory gave the other candidate a chance to respond. He followed up on hot-button issues with additional questions. Most questions from the panelists were on the mark — except the one on renaming the Washington Redskins. That one wasted valuable time better devoted to pivotal issues confronting the next governor. All the candidates got away with stretching — or misplacing — the truth in their remarks. Gansler misled viewers about the reasons he was sanctioned, when Montgomery County state’s attorney, by the Maryland Court of Appeals for ripping into defendants in criminal cases at press conferences. We haven’t heard the end of this. Brown inaccurately claimed credit for fixing the health exchange, saying he “changed leadership” (no, the exchange leader quit) and that all is now hunky dory. Hardly. He also claimed leadership of the base-realignment effort in Maryland. That’s hardly the case, either. All three blew it on their opening and closing statements. He’ll give “voice to the voiceless” and stand up to unnamed “special interests” (Gansler). He’ll “build a better Maryland” and continue the direction of the current administration (Brown). She’ll “bring results for Maryland families.” She promises “policy, not platitudes” (Mizeur). Those clichéd statements explain why a majority of voters remain undecided. They may look for the “none of the above” button on primary day. The debate found its way onto viewers’ TV sets throughout Maryland — except in Garrett County. Once again, the 30,000 citizens of Garrett were frozen out of any ability to learn what in the world is happening in Maryland politics. Thanks to a brain-dead ruling by the Federal Communications Commission, Garrett receives only TV signals from Pittsburgh. It is an outrageous and undemocratic situation that discriminates against 92 “orphaned counties” in the United States. Yet Maryland’s members of Congress have done little or nothing to change this situation. Shame on them. Finally, there’s one thing the candidates agree wholeheartedly about — the winning political color this campaign season is Columbia Blue. During the debate, Mizeur, Brown and Gansler all displayed that unique shade of blue-gray named after my New York alma mater’s collegiate color. At first glance, I thought the “in” color for Maryland pols in 2014 was Carolina Blue, named for that university in Chapel Hill, N.C. But a closer examination of photos from the debate revealed the color selection was a darker shade than sky blue. By the way, Columbia Blue also is the school color of Johns Hopkins University. And it is, oddly enough, the team color of baseball’s Kansas City Royals (why not Royal Blue?) and in a sad twist of fate, it’s the team color of racist Donald Sterling’s Los Angeles Clippers basketball team. Wonder what Brown, Mizeur and Gansler will be wearing at the next debate on June 2? Gov.-elect Hogan continues to work on his relationship with Comptroller Peter Franchot, who holds a key vote on the three-member Board of Public Works, which will review all of the major contracts of the Hogan administration. Hogan has continued to meet with key Democrats, office holders and interest groups throughout the state as he prepares to take office in a month and submit a budget.